If you knew that you were about to die, and could gather your loved ones around you, what would you tell them? What advice would you leave with them? I ask that question because I believe this to be the context of this letter from Peter. Jesus prophesied that when he was old Peter would be bound and taken where he did not want to go. This was coming true. Peter is writing this letter from Rome, telling the Church how to act during persecution and he will soon be crucified on an upside down cross somewhere around 68AD. It makes sense therefore that if these are among the Apostles’ final words to help the Church get through a period of persecution, then surely his words could help us get through our day-to-day challenges. He says a lot in this passage but I want to focus your attention on four salient points. First he gives the Church advice about how to treat one another. “Have unity of spirit, sympathy, love for one another, a tender heart, and a humble mind.” This counsel makes great sense because the last thing a Church that is being persecuted from without needs is fighting within. Simply put division is not of God, because we are all a part of Christ’s Body and therefore need to be working together. In our natural bodies, when one part of it wars against another part, we call that cancer. We should have the same opinion about fighting within the Church. But Peter’s imperative is more than an appeal to just get along. His is a call to like-mindedness and love. This call requires us to be more intentional in our relationships with one another. Just as a marriage takes work to be healthy so we have to work on our relationships to be a healthy Church. If we are only together one hour a week for worship and then go our separate ways, we will never develop the like mindedness and love to which the Apostle calls us. In turn we will be unprepared to face opposition should it come our way as it did in the first century. But as we seek out ways to be with one another, to serve with one another, to serve one another, we will reap the rewards of unity and the Church will be strengthened. It is significant that the Apostle adds a critical ingredient to this mix of like-mindedness and love. That ingredient is humility. Have you ever walked away from an egomaniac and think to yourself, “That is one of the most loving individuals that I have ever met.” Of course not because all they love is themselves. It takes humility to put the other first. Jesus certainly modeled this for us in taking on flesh and coming not to be served but to serve as Paul so beautifully put it in the Book of Philippians. On this Memorial Day weekend I cannot help but think about those who gave their lives for us to be able to worship freely. They did not seek fame or fortune. They sought only to be faithful and we honor their memories when we seek to do the same and follow their example. I also appreciate in looking at their example that we could never confuse humility with weakness. In fact they show us it is just the opposite. The antidote to fear and intimidation is found in the rest of the sentence,” but in your hearts sanctify Christ as Lord.” To make it clearer, the New Living Translation has this passage read, “Don’t be afraid and don’t worry. Instead you must worship Christ as Lord of your life.” So it is the LORDSHIP of Christ that replaces our fears and anxieties. It is so because his Lordship puts things in their proper perspective. Much of our fears and anxieties are caused because we wrongly think that we are in charge and it all depends on us. But then we hear from Jesus “I am the Vine and you are the branches…apart from me you can to nothing.” Or we hear in the Acts reading today, “In him we live and move and have our being.” Jesus is Lord and because He is Lord then He is our environment. In him we live and move and have our being. Jesus is Lord and because He is Lord we can do nothing without him. Thus He is in charge and it does not all depend upon us and thanks be to God for that! When we first moved here in ‘96s to plant a church I found that there was so much to do and so many chances to do it wrongly that I struggled with anxiety and had difficulty sleeping at night. Weighing on me was more than just a fear of failure but also the responsibility of the few souls in my care. One day it occurred to me to talk to the Bishop about it since he had responsibility for 50 odd churches (and some of them were quite odd). So I asked him, “Bishop how do you sleep at night with so much responsibility?” He said, “I do what the Pope does.” “What is that?” He says, “Lord, its your Church after all so I am going to bed.” I don’t know where the Bishop got that information but it worked for me. When we remember who is the Lord and who is the servant or who is the Shepherd and who is the sheep, burdens are lifted from us. There is a wonderful collect in the Book of Common Prayer that picks up this theme. I find it helpful in telling us how we sanctify Christ in our hearts. Heavenly Father, in you we live and move and have our being; We humbly pray you so to guide and govern us by your Holy Spirit, that in all the cares and occupations of this our life we may not forget you, but may remember that we are ever walking in your sight; through Jesus Christ our Lord. Amen.” This is a prayer that highlights our dependence upon God in every facet of our life and we ask to be made continually aware of God’s oversight. This is not in a fearful sense, like God as a state trooper watching to see if we break the law, but it is oversight like that of a loving father or mother who watches over their children at play and at sleep. Thus we should live our lives by constantly and continually following his leadership. That is how we sanctify Christ as Lord. Additionally sanctifying Christ in our hearts is how we find true freedom. If you are utterly dependent upon Him then you are not dependent in an unhealthy fashion upon anyone or anything. You don’t need to be fearful of what others can do to you or be intimidated by so called important people because you know that you serve a Sovereign God. When I was going through the ordination process, which I call ecclesiastical hazing, this was an important truth to keep in perspective. I had to get approval from my Rector then the Bishop, then in seminary the professors vote on my acceptability or not. I also have to go through psychological evaluations and also pass through the Commission on Ministry and the Standing Committee. It can be very frustrating because here you are trying to answer a call from God and all these strangers are voting on you like it is the American Idol show with Simon telling you how dreadful your sermon was. That is why I had to constantly remind myself that God is in control and like it says in the Book of the Revelation, “what he opens no one can shut and what he shuts no one can open.” (Rev 3:8). It is no different for whatever calling you have received. It is all too easy to believe that your life is in the hands of your boss or your customer base or under the control of family members, but that is not the case. If you are under the Lordship of Christ, then your life is in His hands and while others may try to cause you to be afraid or be intimidated, you know that they only have the authority over you that He and you allow. As Sovereign Lord He is even able to work things for your good when others mean you harm. I was reminded last week that the best thing that has happened to us as a church was getting kicked out of our previous building. (Actually we chose to walk away). It sure didn’t feel like a good thing at the time but I can tell you now when I round that corner and see our new chapel I drive in with a smile on my face. St. Peter’s third piece of counsel moves us from shaping up our priorities into taking action. He says, “Always be ready to make your defense to anyone who demands and accounting for the hope that is in you.” Again I prefer the New Living Translation, “And if you are asked about your Christian hope, always be ready to explain it.” I find it inspiring that Peter’s advice to a Church under persecution is to be evangelistic. Rather than going under ground they are told to stand their ground and to share their faith. We know from Church history that this advice was followed and there are many great accounts of testimonies given by Christians facing execution for their beliefs. And as you know, rather than Christianity being stamped out by persecution, it flourished under it. The Church in Africa is having that same experience today as it faces persecution by the Muslims. I have been told that they are not able to produce priests and bishops fast enough to keep up with the explosive growth. I want to be quick to point out that St. Peter tells us how we are to stand our ground and defend our position. He says “But you must do this in a gentle and respectful way.” Isn’t that how Paul makes his defense in our Acts passage? Rather than condemning them as idol worshippers he sees all of their idols and says, “I see how extremely religious you are in every way.” Then of course he goes on to tell them about Jesus. There are way too many Christians who have gone to the Yosemite Sam School of Evangelism. Their idea of sharing the faith is to yell, “Say our prayers sinner” and to hand out tracts that entitled “Turn or Burn.” But Peter tells us that this pugnacious actively is not true evangelism. We are to tell others why we believe but tell it with gentleness and respect. We are not out to win arguments we are out to tell people some good news. As you have heard others and me say before, evangelism is simply one beggar telling another beggar where to get a free meal. Lastly, Peter tells us to face difficulty by “keeping our consciences clear”. This is very important advice because if and when we do get into trouble, or face opposition, we need to be sure that it is not due to our own sin. There are plenty of people who do not like Billy Graham, but it is not because he bilked a bunch of people out of their money or because he got caught in a motel room with a woman other than his wife. He has been so careful to govern his life in such a manner that people’s problem with Uncle Billy can only be with his message, and because he is God’s Messenger, their problem is ultimately with God. If we will do likewise then when we face opposition, as Jesus said in the Sermon on the Mount, we can expect to be blessed. There is no blessing for suffering for our sins, but there is great blessing in suffering for His Name. The truth is that it takes a great deal of inner strength to be a disciple and face opposition and nothing saps inner strength like a guilty conscience. You can’t look your enemy in the eye when you are so filled with shame that you can only look at the ground. The immediate rewards of sin never outweigh the toll they take on your inner life. Keeping our consciences clear means taking a long-range look and reminding ourselves to stand our ground. These were just a few of St. Peter’s last words to the Church. I appreciate how he cuts to the chase and give such practical advice. Love one another in humility. Sanctify Christ in our hearts as Lord. Be evangelistic with gentleness and respect and keep our consciences clear. I would submit to you that this not only great advice for a time of persecution but they are a good recipe for individual mental health. If we will heed his advice then we will be a Church family that glorifies our heavenly Father and isn’t that the kind of Church that we long to be? Amen. The fourth Sunday of Easter is known in the Church as “Good Shepherd Sunday” which should be obvious by our lessons and hymns. It is also very appropriate that this year it falls on Mother’s Day because the loving care of our mothers beautifully reflects the loving care of our Good Shepherd. But what of those who have never experienced the unconditional love of a mother? The Good News is it is still available from your Savior, so either way it goes today is a day of celebration. I want us to think about Jesus’ shepherding care today through the lens of the familiar Psalm 23. However I fear that this Psalm is so familiar to us that we are no longer impacted by its profound message. Therefore let me introduce a different version to you. Did you know that there is a hip-hop Psalm 23? Here it is. Fear not little flock! I’m not going to use this version as my text. Nothing could be more uncool than an old white guy trying to do hip-hop but I thought that you would get a kick knowing that it is out there. Instead I want us to look at Psalm 23 from Peterson’s The Message. We could actually just stop there because it says so much. First notice the use of the personal pronoun. It does not read, “The Lord is A shepherd” or “The Lord is THE shepherd” it reads “The Lord is MY shepherd.” David is not making an observation with these words; rather he is making a confession. When I was in high school I started having some serious spiritual questions. We were living in Scotland at the time and so my father solicited the help of a guy that he was working in the Air Force who was also a Baptist minister. During our conversation the minister asked me if I believed that Jesus was the Son of God. To be truthful, I felt insulted by the question. It came across like asking me if I believed if George Washington was the first President of the United States. You would have to be a moron to not know that. Of course I believed that Jesus was the Son of God, didn’t everybody? The mistake the minister made was that he did not ask me if Jesus was MY Savior and on my part I wasn’t spiritually tuned in enough to know the difference. There is a huge difference. 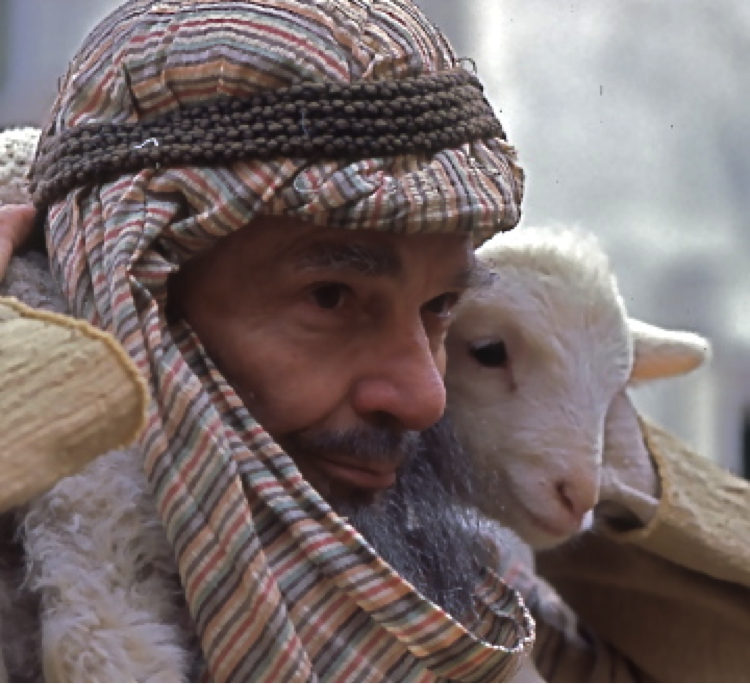 An atheist or even a devil can say, “The Lord is a shepherd.” Only a child of God can say “The Lord is MY shepherd” and that is the relationship with God that Jesus came to give us. On Easter morning Jesus told Martha to tell the disciples, “I am ascending to my Father and to your Father, to my God and your God.” The next week when Thomas thrust his hands into Jesus side and felt the wound he cried out, “My Lord and my God.” St. Paul in his letter to Timothy says, “Remember Jesus Christ, risen from the dead, descendant of David, according to my gospel.” Paul did not call it “my gospel” because it was something that he made up. Rather he said “my gospel” because he knew Jesus to be his Shepherd. He didn’t just know the gospel, he lived it and he eventually gave his life for it. It is amazing what a difference a personal pronoun can make. It’s not good enough He is THE shepherd. It’s not even good enough if He is your momma’s shepherd. The Lord seeks to be and must be MY shepherd. That should be our confession but what a challenge it is to live that truth in this culture. There is constant pressure to get the new version. Our system has within it planned obsolescence. And when you do break down and get the new version then they come out with a new and improved version. Think about tunes on our automobiles. We have gone from the radio, to 8 tracks, to cassettes, to CD’s. And now CD’s are old school. You need a plug in for your MP3. Buy a new computer and it is almost out of date before you get it home and take it out of the box. What is the answer? The answer of the world is that means that we need more. But you don’t have to look very far to see that is not the solution. Last week there was a young woman on the news living in a tiny house with her two kids, barely able to make ends meet. What made that story newsworthy was that her father, David Lee Edwards, twelve years earlier had won $41 million in the lottery. He was an ex con living in Kentucky and although he promised to use his money wisely he burned through $12 million in his first year as a millionaire. He bought homes and cars and jewelry and even a jet with a pilot on call. He went through the rest of it so quickly that he lost everything and ended up living in a storage unit filled with used drug needles and human filth. His wife left him and he died alone in a Kentucky hospice at age 58. He did not leave a penny to his daughter and grandkids. Of course our first thought is that we would not be that stupid. But do a google search on what happens to instant millionaires you will see what a strong temptation it is to be just like David Lee Edwards. We may avoid his extremes but who among us does not often think how much easier life would be if we just had a little more. King David, however, points us in another direction. He points us to contentment. “God is my shepherd, I don’t need a thing.” This perspective on life fits perfectly with a verse from Hebrews. “Keep your lives free from the love of money and be content with what you have, because God said. ‘Never will I leave you; never will I forsake you.’” He knows where the green pastures are and He knows how to get us to the quiet waters. Jesus told us that the Father already knows what we need before we ask for it. He promises to provide for it. We just need to trust Him that He will never leave us or forsake us. I am very grateful that this kidnapping of the schoolgirls in Nigeria has received international attention because this kind of thing had been going on for some time and has not received the attention that it deserves. One of my Facebook friends lives in Nigeria and I asked him if it was an Anglican school that was attacked. He said that he did not know but he said that it was certainly a Christian school because no mosques have been attacked, just Christian churches and schools. The President of Nigeria said that he believed this event will be the beginning of the end for that particular group of Muslim terrorists and I hope that he is right. But such events often present a faith crisis. Why would God allow Christians to be kidnapped and others in a Christian village to be slaughtered by such evil men? The answer to that is that we do not know the answer. Perhaps the real question is why have the industrialized nations of the world stood by and allowed this to happen? What we do know is that this is a conflict between good and evil and this is nothing new. From the Jewish people taken in captivity to Babylon to Christians being martyred under Diocletian, the powers of darkness have always plotted to kill and destroy. They assault the Father by assaulting His children. But just as Jesus’ crucifixion looked like a win for the powers of darkness but ended up being a part of the Father’s greater plan for the salvation of the world; so we can trust that no matter what it looks like on the surface, the powers of darkness do not win. That is the point of the Book of the Revelation to John. But we must also remember from the same book that we are not promised a rose garden. Sooner or later we all will find ourselves in the Valley of Death. One of the modern translations of the Lord’s Prayer, which I hope will never be prayed at St. Patrick’s, contains a line that I think is bad theology. It says, “save us from the time of trial.” I suppose it is okay to pray it, but just don’t expect it to be answered. Jesus promised no one that we would be free from trials. In fact He promised just the opposite. That image of God is sadly very different from what people often imagine. They picture God as an aloof being that for whatever reasons makes it difficult to get to know Him. But if His beauty and love chase after us every day of our lives, if heaven is having conversations about us, then that image has to be wrong. When Jesus was speaking to the woman at the well He told her that God is seeking those who will worship Him in spirit and in truth. God is the One who is seeking. The prophet said that it would be easier for a mother to forget her nursing child than for God to forget us. The Good Shepherd goes after His sheep. Jesus said that He would even leave the 99 to go after the 1 that is lost. Certainly there are times when it feels like the pursuit of God is all on our part but that feeling is untrue. True, we have a part to play. St. Paul says we are to work out our salvation in fear and trembling. But then he goes on to say, “for it is God who is at work in you both to work and to will for His good pleasure.” We would not be able to pursue God unless He was not first at work in us. We love Him because He first loved us. I love this Psalm because I find it comforting to be reminded that He is the Shepherd and I am just a sheep. It takes so much pressure off because it is ultimately up to the Shepherd to get the sheep where they need to be. I’m not smart enough to know where we are going and to tell you the truth it is probably best that I don’t know where we are going. My job is to follow where He leads. Never forget beloved that this whole journey begins with “The Lord is MY shepherd.” If He has not been YOUR Shepherd, but only A Shepherd up until today, today is the day to make that change. As you receive Him in Word and Sacrament become a sheep of His fold. Then all of the wonderful promises of this Psalm will be yours as well. Amen.